Released by Cine-View Publishing B.V.
"Nothing was important to the Colonel than show business"
"The Colonel was a lucky manager!" No male looms larger in the story of Elvis Presley than Colonel Tom Parker. For many years the world was oblivious to the Colonel's secret past as an illegal Dutch immigrant, Andreas (Dries) van Kuijk, who, in the late 1920s, stowed away on a ship and made a new life for himself in the land of opportunity...the USA. Celebrated and feared by many, the man born Dries van Kuijk is inextricably linked to the success of Elvis Aaron Presley. an uneducated, illegal Dutch immigrant who gained fame and fortune beyond his childhood dreams? a carny who got lucky later in life managing some of America's most famous entertainers? a shrewd businessman and master manipulator particularly astute at finding artists who could build a large fan base? an innovative manager who did things other managers wouldn't? The answer is arguably a hybrid of all of the above, and to unravel the mystery of who was the "real" Tom Parker, Constant Meijers takes us on a fascinating journey across two continents. During his journey the viewer is treated to some fantastic insights into the Colonel's psyche which adds immeasurably to our understanding of the complex mosaic which constitutes the Elvis Presley story. What brought the young and ambitious Dries van Kuijk to America? In unravelling the mystery, Meijers talks to those who are best able to shed light on it: the Colonel's sister in Holland, and those closest to him throughout his carny days and most successful period as manager of some of America's biggest entertainment stars: Gene Austin, Hank Snow, Eddie Arnold and of course Elvis. The documentary also offers insight into how Elvis was tamed, subsequently becoming became a hero to those who had originally despised him - the parents of middle America. Much of the documentary's archival footage is impressive, and also instructive regarding Elvis' musical influences. We see and hear the smooth voice of Eddy Arnold on "That's How Much I Love You", the largely forgotten but golden vocals of Gene Austin, and to appreciate how Elvis decided on his interpretation of "I'm Movin' On', we need only listen to the original version sung by the incomparable Hank Snow. Other footage includes the famous duet of Elvis and Frank Sinatra from "Welcome Home Elvis" and there are intriguing interviews with Loanne Parker (the Colonel's widow - what has happened to her biography? ); Eddy Arnold, Joe Esposito, Lamar Fike, Gabe Tucker, Gordon Stoker (Jordanaires), Sam Phillips, and RCA's Joan Deary, to name only a few. 'Colonel Parker de manager van Elvis' is always fascinating, always intriguing, and always colorful, be it listening to the carny ignorant of who Tom Parker was, or the seminal insights we gain from those closest to the Colonel. While Meijers' documentary leaves a number of questions in the Tom Parker story unanswered, it also poses a number of intriguing questions - for instance, who did discover Elvis - the Colonel or Hank Snow? Many fans will recall this documentary which was originally released in VHS format many years ago with the title, 'Looking for Colonel Parker'. The DVD cover is printed in both English and Dutch and while the American leg of Meijers' absorbing journey is in English, his sojourn across the Netherlands is in Dutch with English sub-titles. This in no way way detracts from what is one of the most interesting and well produced documentaries ever made around the Elvis story. My only minor gripe about this release is the absence of 'Scene Selection'. Should a second edition be forthcoming I hope the producers will see fit to add this feature. Verdict: A long overdue DVD release of a fascinating, eye opening documentary. 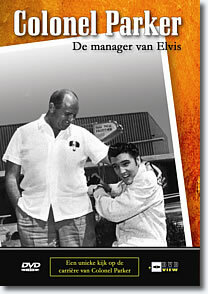 To know the Elvis story we must also know the Colonel Tom Parker story, and 'Colonel Parker De manager van Elvis' is a valuable resource in understanding the latter. Constant Meijers deftly strips away several layers of the Colonel Tom Parker conundrum, and in the process leaves us wanting a lot more...just like the Colonel cleverly did with Elvis! Recommended viewing.